WanderMan: Time For New Batteries - Warning! Last week, I was surprised by an almost complete meltdown and almost fire with my two battery house bank. Not good. Could I have avoided the near catastrophic event? Maybe. In any case, heed my cautionary tale. As many of you know, I finally finished the roof installation of the second generation of my semi-flexible solar panels. These put out a good bit more power, have no anodized aluminum to fail (and short out the whole panel!) are a bit lighter and are slightly smaller. Since everything was buttoned up and the junction box's leads soldered, I figured it was time to really test the system before a major trip. So I unplugged from shore power that night and ran a few items for a while (a long while) to run down the batteries. Seemed like everything was fine. I used about 55 Ah worth of power (the Bank has/had 210 Ah/2 = 105Ah @ 50%) As per my new battery monitor. All seemed well enough. I shut everything off and locked up the RV for the night. The solar charging system would "fill up" the batteries in the AM when there was some sun. At about 9 AM the following morning I went down to check on the status and was shocked to see the battery temperatures above 90 degrees F! They seemed to be charging OK, it was a bit warm out....I decided to wait and see. Went off to teach a class for the day. Upon my return, the batteries were at 125 degrees F!!! This is BAD! I could smell the acid from 3 feet away. I immediately opened the battery compartment to see grey smoke coming out of the front battery. Not vapor...actual SMOKE! I went in, shut down all charging and came back out with a non-contact thermometer to check the actual temperatures. The front battery was at 211 degrees F and the rear at 140 degrees F. I disconnected the front battery and gently removed it (making sure no acid was coming out.) I probably should have let it cool a bit, but I LIKE my RV and prefer it not to be toasted and crispy. The other battery began to cool quickly. When it reached the outside temperature of 81 degrees F I reconnected the second battery to the system. When the charging system was reconnected all look OK. When tested, the front battery had two completely failed cells. It would have killed the other battery in short order. As it is, the other battery's life span has been severely shortened. The result of all this terror? Time to buy new batteries. I was hoping to put that off until Lithium Phosphate (LiFePO3) were ready for prime time or at least reasonably priced. They are still at least $1500 or more per battery for the ones I want. 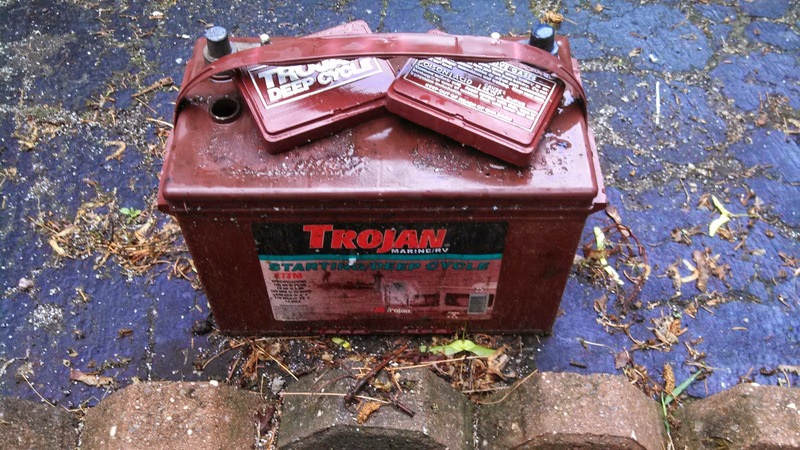 So, for now, I sought out and found 2 slightly larger Trojan Batteries. My battery drawer is quite small, but was originally intended to fit 3 Group 24 Batteries. One for the engine start, and two for the "house." I had 2 Trojan 27TMX's in there. I managed to locate a pair "only" 2 hours away. Quick road trip and I had them back home. Shut down all power in/to the RV and disconnected all battery cables. Making sure to note where each one went and whether it was positive or negative!! Lifted out the other old battery and then cleaned all the acid and corrosion out off the compartment. Checked the fluid levels in the new batteries then placed them in the box, shimmed them to make sure they didn't slide around and reconnected the cables. The new batteries have two 3/8" threaded stud terminals, so reconnecting was easy. This could have gone the other way. I could have come home to an charred wreck of an RV. I have no one to blame but myself. Batteries need to be monitored and checked. If you are used to seeing a particular set of readings and they change for some inexplicable reason (you didn't change/add/modify anything) be wary!! It could end in disaster. Next week, I will do some real world testing on capacity, but the manufacturer states I will not get full capacity before I hit 10 discharge/charge cycles. We'll have to see. The group numbers are rough standards from the battery companies with regards to size and the type of connection post on the battery. A quick google search for "battery groups" will give you lots of info from various sources.. I'm sure you didn't take the faulty batt apart to see, but after 7 yrs I would guess that a couple of plates within the batt broke from their mountings? Would Optima type batts have done any better? Great article we all should read. The plates looked fine from up top. It was likely age and sulfation that killed them. Optimi's, while more resistant to vibration, aren't well suited to the RV deep cycle role. They have relatively low maximum storage AND they are quite expensive per amp/hour.